The popular arts and crafts chain Hobby Lobby has agreed to forfeit over 5,500 ancient artifacts and pay $3 million in a civil settlement after the U.S. Department of Justice filed a complaint asserting that the items had been illegally shipped into the country from a dealer in the United Arab Emirates (UAE). The company denies any intentional wrongdoing, but regrets its trust in the dealers and shippers of the goods. According to reports, in 2009, Green traveled to the UAE to review a number of cuneiform tablets and other artifacts as the company had begun acquiring historical and biblical pieces for its collection. As previously reported, the Greens plan to open the Museum of the Bible in Washington in November—a 430,000-square-foot facility that will house one of the world’s largest collections of ancient biblical scrolls, codices, papyrus fragments and other historical artifacts. 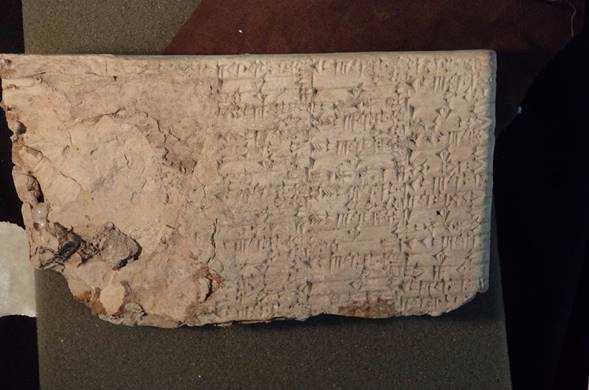 However, in obtaining a cultural property attorney for advisement on purchasing these particular pieces, Hobby Lobby was allegedly warned that there existed a chance that the goods may have actually been looted from archaeological sites in Iraq. But the Greens moved forward in purchasing the artifacts for $1.6 million and an unidentified dealer shipped the items to the U.S., falsely labeling them as “ceramic tiles” and “clay tile samples.” The shipping labels also wrongly claimed that the items originated in Turkey. Customs officials intercepted some of the boxes, and a year later, more boxes arrived that were falsely labeled as originating in Israel. “American collectors and importers must ensure compliance with laws and regulations that require truthful declarations to U.S. Customs and Border Protection, so that Customs officers are able to scrutinize cultural property crossing our borders and prevent the inappropriate entry of such property,” Acting United States Attorney Rohde said in a statement. “If they do not, and shippers use false declarations to try to clandestinely enter property into the United States, this office and our law enforcement partners will discover the deceit and seize the property,” he said.